Two-axis key joystick sensor module by the use of a PS2 rocker potentiometer, with (X, Y) 2-axis analog output, (Z) 1 button digital output. With the Arduino sensor expansion board can produce remote control and other interactive works. In addition, this product in order to allow customers to more easily with the Arduino expansion board and other standard interfaces, in the design of the X, Y, Z axis of the circuit are separate leads, the user can use 3-pin ARDUINO special line really plug into the expansion board. 2. Output signal: the module special two-way analog output and a digital output interface, the output value corresponding to (X, Y) biaxial offset, the type of analog; keys that the user press the Z axis, Its type is digital switch. 3. Arduino controller can be programmed, the sensor expansion board plug, complete with creative remote interactive works. 4. Cross joystick is a bi-directional 10K resistor, with the rocker in different directions, the tap resistance to the change. This module uses 5V power supply, the original state of X, Y read voltage of 2.5V or so, when pressed with the arrow direction, the read voltage value increases by the maximum to 5V; arrows in the opposite direction to press, read the voltage decreases, The minimum is 0V. In fact, this module is a potentiometer, x, y-dimensional data output port reads out the analog voltage. This figure does not draw the above z-dimensional data output, z-dimensional output only 0 and 1, can be achieved by a button. All in all, it is a combination of the potentiometer and button. 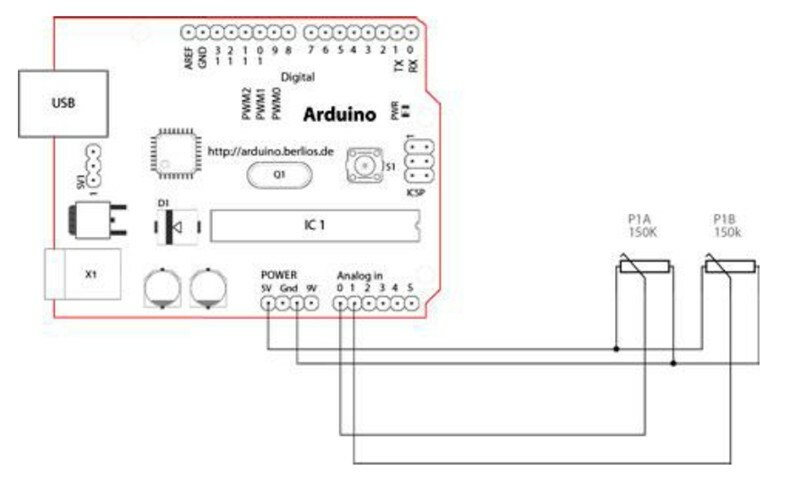 In the Arduino, use it, x, y dimension we received two analog ports to read their values, while the z-dimensional we are connected to the digital port, connected to the power and ground.